$6.95 (plus $1.50 shipping) Order by mail and pay by check. We need the Wisdom who has walked on the face of the deep, who has encircled the vault of the sky, who has covered the earth like a mist. I was in the middle of painting this image outside in my backyard, when a sprinkle of rain fell from the sky. You can see the results of individual droplets in the upper right of the painting. The unexpected rain seemed to fit the words of Ecclesiasticus, “I (Wisdom) covered the earth like a mist.” Moisture touched the earth: we need the new moisture of Wisdom to meet our dryness. We need to be ‘covered’ like the earth is covered by the freshness of mist: the offering of Wisdom’s renewal that softly soaks our souls. $20.00 (plus $3.00 shipping) Order by mail and pay by check. This CDROM contains twelve images; each is in high resolution and is easily downloadable for use in PowerPoint. 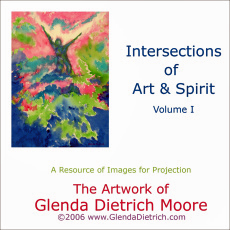 The CDROM copyright agreement allows the purchaser to use the images in any setting where projection is possible, such as services of worship, weddings, baptisms, at retreats, and during classes, sermons, or meditations. The images may NOT be reproduced in any printed form, used as wallpaper on a computer, or distributed digitally in any way including via e-mail. The purchaser agrees to adhere to the entire copyright agreement included on the CDROM. Please contact Glenda Dietrich with questions or for possible exceptions. Suggestions of artwork you would like to see on future CDs are welcome! Contact me. 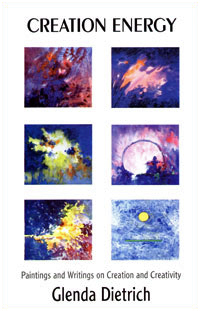 These books are available from The Centering Corporation, Omaha, Neb. 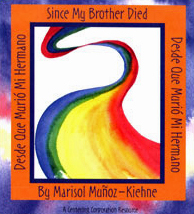 Since My Brother Died – written by Marisol Muñoz-Kiehne, illustrated by Glenda Dietrich. A book written in both English and Spanish to help children and youth work through the death of a sibling. 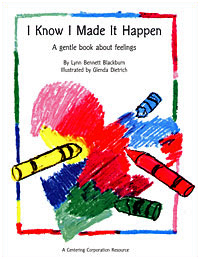 I Know I Made It Happen, A Gentle Book About Feelings – written by Lynn Bennett Blackburn, illustrated by Glenda Dietrich. Helping children deal with feelings of guilt and blame when bad things happen.